If you love flowers as much as I do then you’re going to go WILD when you see today’s botanical bridal shower shoot! It’s all kinds of gorgeous with a big emphasis on fashion! So much so that all of the models you see here are beautiful fashion bloggers who were told to wear their most glamorous floral frocks! 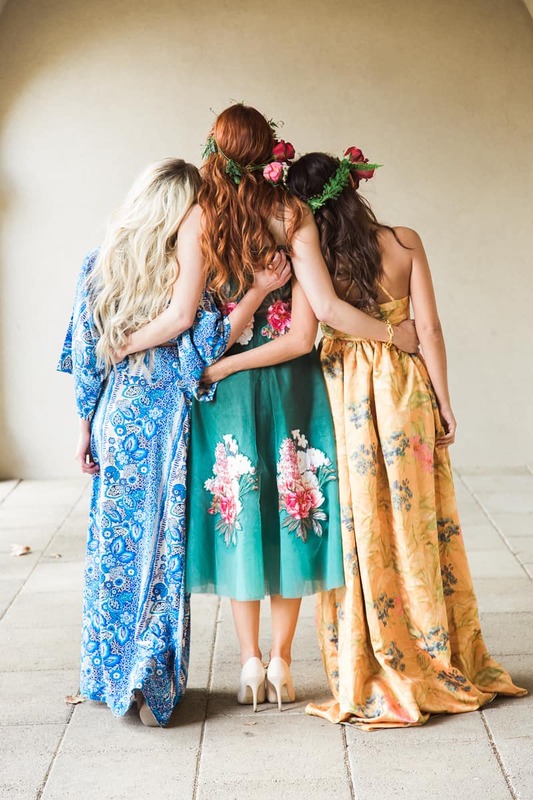 I really love the idea of asking your girls to wear something floral to your bridal shower to quickly enhance a flower filled theme! “Girls are getting more and more involved with their wedding planning and that even extends to their bridal shower or bachelorette party. They want it to be unique, beautiful, and fun. We had so much fun putting this bridal shower shoot together. We wanted to focus on richly saturated colors that could really pop in the outdoor scenery. We imagined these girls and the bride adoring fashion. Think Gossip Girl but with Pitch Perfect personalities! The theme of the bridal shower was floral botanical, so naturally each guest arrived in their most glamorous floral frock. We really wanted to emphasize fashion and several shades of color in this shoot to show that you can have those themes in your bridal shower or bachelorette party. Claire Duran and Alyssa Vincent did a marvelous job of capturing the story of the everlasting bond that women have at their bridal showers. These girls partied all night, and it shows in the final shots of them sleeping on the couch! Love it! Love the colours, the hair and the floral delights.